Wishing for the perfect countertop? – So is our competition. After over 20 years of working in the stone industry, we decided to take matters into our own hands and create GraniteTops.com – your trusted natural stone fabricator in New Jersey and the NYC Metropolitan area. We took the best business practices and added a dedicated team of professional craftsmen to provide you with a great service, at a price that’s hard to beat. Our principles are simple – honesty, transparency, and positive work ethic. We believe that when our work is done, our customers should become our friends, so we treat them as such. With us, you’re not just a number. Our wide range of products and services allows you to save time, while getting the personal attention you deserve. From kitchen countertops and bathroom vanities, to fireplace and tub surrounds – we will fabricate with precision and expertly install your favorite stone surfaces. Our expertise extends to natural stone flooring installation, restoration and maintenance for both residential and commercial applications. Get in touch with us for quotes on these and other custom stone surface projects for your home. Our on-site stone yard is full of carefully selected stones imported from around the world. 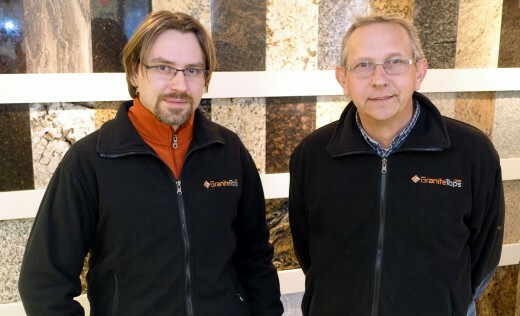 The Granite Tops stone selection is actively curated by renowned kitchen and interior designers. Their professional input helps you get to the right color without wasting time on outdated and out of style choices. Our yard is arranged to allow you a safe and pleasant viewing experience. Unlike some other fabricators, we display our slabs in full view, without risking you going in-between tight A-Frames. Getting granite countertops from us is a two stage process. First, we need to come out to the job site and take detailed measurements of your cabinetry. Once we create the templates, we can start the fabrication process. Finally, the completed tops are installed. Our typical wait time for measurements is one to two days. For most projects it takes another two days for fabrication of the countertops once the slabs are approved by you. In other words, if you call for templates on Monday, we will likely install your granite tops on Thursday – that’s just three days! While we try our absolute best to give you the lowest prices possible, you should always look at the whole picture when purchasing all granite and marble countertops. Typically, the largest factors influencing the price are the stone and its quality, size of the project, and edge finish. However it is sometimes difficult to see or predict other factors that contribute to the purchasing experience as a whole. Quality of the work, skill of the installers, their professionalism and courteousness – these are some of the aspects not shown on the estimate. That is why we stand by our company philosophy. It is more important to us to do honest, great work and build long lasting relationships with out customers, than to make a quick buck cutting corners at every stage of the process.